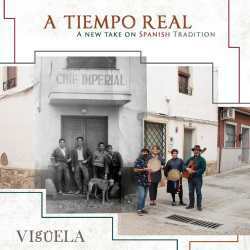 Vigüela’s A Tiempo Real is a double CD recording which looks at traditions from the oft-forgotten heartland of Spain, Castilla La Mancha, located primarily to the south and east of Madrid but also southwest of the capital. While most of the people of the Spanish state live either in Madrid or on the periphery, La Mancha is a more typically “Spanish” area and part of the Castillian heartland, albeit with stronger Arabic traditions than many parts of Spain. This is a dry area that has seen actual depopulation, from the time of the Civil War (1936-39) to the present. The home village of this band has lost three-fifths of its population. Not being overly familiar with the music of this region, I am reminded of neighboring southern traditions such as that of Alicante province, Estremadura and Andalucia. Vigüela is a six-piece band with a multitude of singers who also play a variety of traditional instruments. Accordingly rural preoccupations and village life make up the subject matter in many of the songs performed. The disc begins with a powerful ”Arrimate pichon a mi” featuring the alternating male and female vocals in the Nochebuena (Christmas Eve) style. Songs are performed in a different way depending on the time of year. Usually, guitars and some excellent, varied percussion accompanies the songs but, “Moreno mia” is a short, heartfelt a capella ‘tonada’ sung by Maria del Rosario Nieto Palomo. I’m not sure of the provenance of this song, but it sounds Estremaduran, to me. A song like “Las doce palabras” shows how percussion can be used along with voice to create a lot of drama without overstatement. "Echa la soga al barco"
Vigüela don’t stop at interpreting the traditional repertoire, they also recreate it, in such songs as “Echa la soga al barco” where only one verse was remembered, and they created more. Originating in the tiny village of El Carpio de Tajo, which is actually located West of Madrid and in the Toledo province, the band includes such instruments as castanets, tambourines, zambomba, triangles, but also a frying pan, a bottle, and a jar. They are inspired by the traditional style of Tia Chata, a great jota singer. Learning from the masters, rather than the formulas of “academic” musicians, they play the jota, malaguena, seguidillas as they are meant to be played. Vigüela is: Carmen Torres Delgado,vocals and percussion; Maria del Rosario Nieto Paloma, vocals and percussion; Juan Antonio Torres Delgado, vocals, rebec, guitar,percussion; Luis Garcia Valera, vocals, guitars/lutes, percussions; Javier Gómez Garcia, vocal guitars/lutes, percussion; and Eduardo Gómez-Olmedo Moreno, vocals, guitars and lutes.